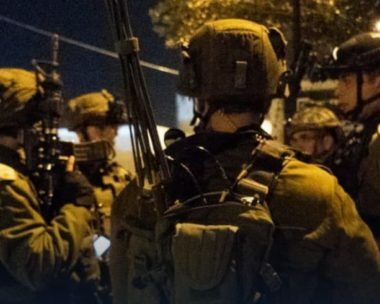 Dozens of Israeli soldiers invaded, on Tuesday at dawn, Jenin city and Jenin refugee camp, in northern West Bank, shot one Palestinian and abducted five others, while undercover soldiers abducted a father and his son in Wadi Burqin area, west of Jenin. Media sources in Jenin said a young man was shot with a live round in his knee, after the soldiers invaded Jenin city, stormed and ransacked several homes, and fired many live rounds, rubber-coated steel bullets and gas bombs at local protesters. They added that the soldiers also broke into and ransacked many homes in Jenin refugee camp, and abducted Yousef Shalabi, Rash Mohammad al-Qaisi, Nasser Hisham Abu Tabeekh, Najeeb Awni Jweil and Mohammad Waddah al-Asmar. Furthermore, undercover Israeli soldiers invaded the home of Khaled Mansour, in Wadi Burqin area, and searched the property before abducting him along with his son, Abdullah. It is worth mentioning that dozens of soldiers installed roadblocks surrounding Ya’bad town, west of Jenin, and on the main Jenin-Nablus road, before stopping and searching dozens of cars, and interrogated many Palestinians while inspecting their ID cards. On Monday at night, the soldiers fired many live rounds at Palestinians, east of the Zeitoun neighborhood east of Gaza city, wounding a young man in his leg.